It seems like it’s been FOREVER since I had a birthday party to prepare for! Last year we did parties for all 4 kids, mostly to try to get my blog up and running. But 4 in one year is simply too much (more about the money, and less about the parties themselves). We decided to do big parties every other year and small family parties on the other. So this year was the boys year for parties. And the girls got the smaller family parties this year. We had one lego party in January and we have another one coming up next week! 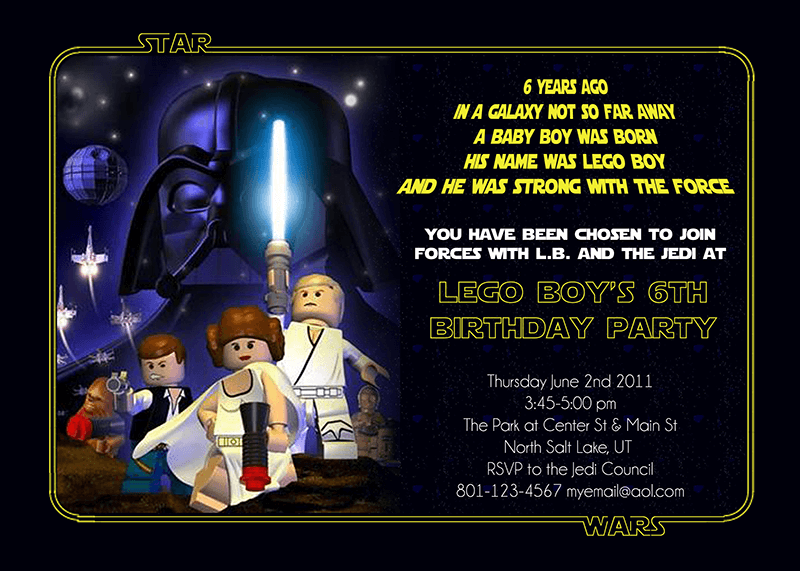 Lego boy has been talking about this birthday party since the minute his last one was over! Last year was Lego Indiana Jones and this year is Lego Star Wars! As usual I used photoshop to create these invitations! Printed 5×7 prints and delivered them to all the boys in his classroom! Now on to working on the party (and the cake!). Does it show of my totally Geek-hood that I’m more excited about this party than any I grew up with! I am having a BALL planning the food alone! Update: The Lego Star Wars party went GREAT and I hope you all enjoy it! This is AWESOME – we are probably going to have a LEGO party for my youngest, we went to Legoland last month so he’s totally into it. Thanks Claudia! We LOVE lego parties. We’ve done 4 now. love love LOVE them! We’re pretty excited to have another one. This is a fabulous invitation. I’m PS challenged and am amazed you created this masterpiece. My son is going to love love love it! Thank you for the download on FB. You have made my last minute planning for my son’s 7th birthday party so much easier. Not to mention I am actually excited about this and “in to” planning it now. Thank you. Thank you so much! I’m so glad you were able to find and use the downloads! your idsea are great can i get the pdfs on these??? you have very great ideas!!! if you like my facebook page click on the tab “free lego star wars food labels” then click on the blue links to open the pdf labels or the jpg or psd of the invitations then save them to your computer. I was on your FB page and noticed your Star Wars invitations. I tried downloading the invitations, but couldnt, it just showed a picture of it. Is there a way we can edit them? that’s so weird, no one else has had a problem, I changed the coding a bit, can you check and see if it’s working now for you? Also which browser are you using? Chrome, Firefox? Maybe I need to fix something specific to your browser! The labels are just in a PDF so no editing, the invitation is offered as either a jpg and you’ll have to use a program to add text, or a PSD if you have photoshop with the text layers already added. I got so many requests I never took them off FB, they are still there. hello, by chance is this invite still available? i liked your FB page, but i think the format has changed in FB so there are no longer tabs. any advice on how/where to find it? Thank you! I too am still looking for these if I can get them! The party is in a couple of weeks. Trying to find this file. Can you please let me know where i can find.download it?